‘Tis the season to try a new trend this year! For holiday décor inspiration this season look no further than right out of your very own window. Incorporating the beauty of outdoor elements into your holiday decorations is sure to make your season merry and bright by creating a warm, rustic, and all-natural ambiance to the home. Not sure how to get started? Don’t get your tinsel in a tangle. We’ve narrowed down our favourite techniques so bringing the outdoors in this holiday season a joy! 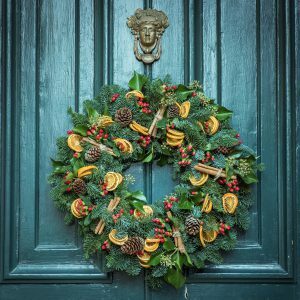 An easy and inexpensive way to include natural elements into your holiday decor is by adding greenery from your very own yard. Don’t put away your pruning shears quite yet – go dashing through the snow and collect cuttings from your trees and bushes to create stunning centerpieces and wreaths. Pro tip – pine tree clippings will add a beautiful aroma for all to enjoy. Spread holiday cheer throughout your home by including citrus fruit decorations. Use lemons, limes, or oranges in your arrangements to create a festival focal point. A stunning ornament can easily be created by inserting cloves in a festive pattern, such as a star, into a lemon then attaching a bow with a hot-glue gun. Your house will be the merriest on the block with natural pine and birch filled planters and pots welcoming guests to your home. Using branches, greenery, and pinecones from your own yard, arrange into planters and pots that you have left over from the summer. For a little extra ho ho ho, spray silver sparkle spray paint onto some of the branches. One of our favourite ways to use pinecones during the holidays is a DIY pine cone wreath. Just collect different sizes of pine cones, spray about half of the cones with white spray paint, then attach onto a wire wreath using florists wire, both of which you can get at any craft store. You’ll have a beautiful, snow-dusted pine cone wreath to hang up this silent night. With a variety of different colours and textures found right in our own backyard it’s easy to deck your halls with soft, nature-inspired decor. To enhance your indoor and outdoor space all year-round, contact one of our Salisbury designers for your next landscaping project.